Buying a new vehicle is a very exciting moment to experience. Before that moment arrives, however, a number of things must be considered to determine which is the right vehicle for you. Although every vehicle type has its positives and negatives, there are many reasons why you should choose an SUV to get you around town. When it comes to benefits, there are a number of them that make an SUV a smart buy. 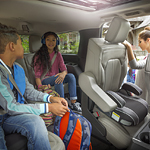 At the top of the list of benefits is the ability of SUVs to carry large groups of people. This is an important factor if you have a large family or you prefer to not have to make multiple trips to get people around. Towing capability is another benefit that illustrates SUV's versatility and makes it a smart buying decision. If you love horses, boating, camping or anticipate ever needing a vehicle that is able to tow, then buying an SUV is a wise decision.